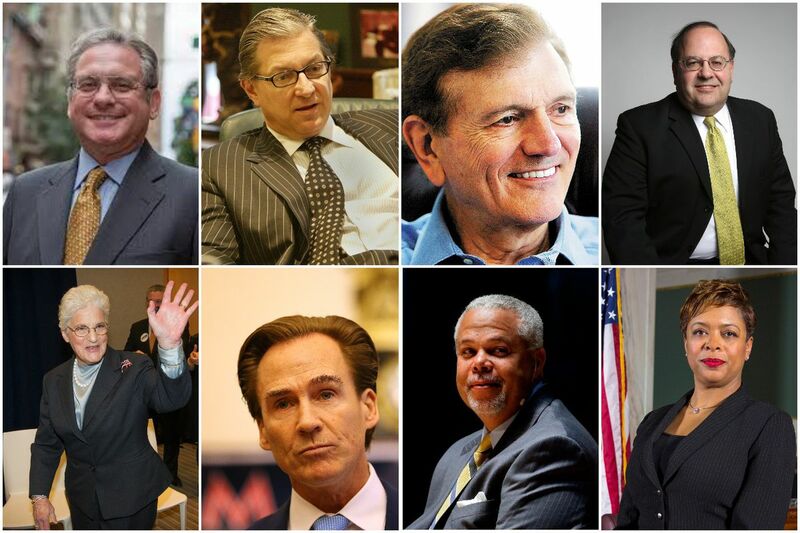 Potential 2019 Philadelphia Democratic primary mayoral candidates include, (top, left to right) former City Controller Alan Butkovitz, attorney George Bochetto, businessman Tom Knox, Councilman Allan Domb (bottom, left to right) former District Attorney Lynne Abraham, Lt. Gov. Mike Stack, state Sen. Anthony Hardy Williams and Councilwoman Cindy Bass. Some have the cash to make real trouble. Some are flirting but unlikely to jump in. And some have nothing to lose. Did Philly police just bike-doze Mayor Kenney’s relationship with progressives? No list of potential mayoral candidates would be complete without Tom Knox, who sank nearly $11 million of his own cash into the 2007 primary but finished second to Michael Nutter. Knox, who considered running in 2011 and 2015, says he will get into the primary if his friend George Bochetto does not. "I tell you, I don't like Jim Kenney's approach to things," Knox said. Bochetto stepped out of the 1999 Republican primary for mayor 20 years ago, announcing that he was "not ending my candidacy for mayor" but "simply deferring it to a future election." Could this be it? Now considering a run as a Democrat, Bochetto could be formidable with Knox's financial backing. "I'm being encouraged by a lot of people to do something," said Bochetto, who said he has met with political consultants "who like my chances." Rounding out the money crew is City Councilman Allan Domb, the only candidate in Philadelphia to win election after triggering the "millionaire provision" in the city's campaign finance limit law, which doubles the amount of allowable contributions if a candidate donates more than $250,000 to his or her campaign. There's plenty of chatter about Domb, who sunk just under $1 million from his real estate empire into his 2015 victory. Domb, who has fallen out with Kenney this year over the councilman's push to increase delinquent property tax collection and other issues, declined to comment. For months, political insiders have been floating State Sen. Anthony Hardy Williams as a contender. Williams, who finished second in the six-candidate 2015 Democratic primary for mayor, knows how to play this game. "I have not thought about being involved in the mayor's race, but other people are thinking about it for me," he told Clout. "If I say I don't rule it out, then I'll automatically become a candidate. And if I say I rule it out and I run, I'm a liar." Former District Attorney Lynne Abraham, who finished third in the 2015 primary, said she is giving another run some thought. But her experience three years ago, when four super PACs spent more than $11 million on independent expenditures to back Kenney and Williams — more than the six primary candidates spent together — is not something she'd like to relive. "I saw how elections are being bought and paid for by outside interests," she said. City Councilwoman Cindy Bass, increasingly at odds with Kenney on issues ranging from stop-and-frisk to his proposed property tax increase, is also being chattered about as a candidate. A source close to Bass says she has been approached about a 2019 run. Of all the potential 2019 candidates, former City Controller Alan Butkovitz seems closest to pulling the trigger. Butkovitz, who lost a bid for a fourth term last year, said "it's likely" he'll challenge Kenney in the primary. And he's already got a platform. Butkovitz, who has railed about the soda tax Kenney pushed City Council to approve, says he would repeal that levy and cap property tax assessments so they would not increase annually by more than twice the rate of inflation. Lt. Gov. Mike Stack's fall from power has been riveting and already he's looking for a way back. Stack, who lost his bid for reelection in May after Gov. Wolf stripped him of staff amid accusations that he and his wife had been abusive toward state employees, could run for mayor, City Council, or the U.S. House. Spokesman Marty Marks said Stack "is keeping all his options open." "He has friends in politics who have supported him and he's supported them over the years, and so there's people he would not want to run against. … He never expressed to me an interest in running against Mayor Kenney," Marks added. Whatever happens, the odds favor a second term for Kenney. It has been nearly seven decades since Philadelphia voters approved a City Charter that limits a mayor to two consecutive terms. In that time, seven Democrats have won second terms, while two opted not to run again. No mayor has been defeated in a bid for another term since then. It has been 71 years since Philadelphians elected a Republican as mayor, though Sam Katz came close, losing to John Street by 9,447 votes in 1999. It's a tough task, running as a Republican in Philly, where 77 percent of the voters are registered Democrats. The GOP makes up just 11 percent of the registration, while independent voters and members of smaller political parties constitute the other 12 percent. The GOP nominee next year may be provocative, if not competitive. South Philly defense attorney William "Billy C." Ciancaglini, a Democrat-turned-Republican, is currently the only declared candidate for mayor. He squeezed into a selfie with Vice President Pence during an event Monday at the Union League and then tweeted the picture with this: "I'm pretty sure I heard this guy say into my ear, 'Donald and I endorse you for Mayor.'" Michael Meehan, chairman of the Republican City Committee, said he has spoken about 2019 with Ciancaglini and one other potential candidate, whom he declined to identify. "In this day and age, the identification of them could be the termination of their interest because of the hostility it generates," he explained. Meehan says he expects just one Republican candidate, but would be thrilled to have a competitive primary. The party's nominee will have to raise "at least $2 million to run a credible campaign," he said. Melissa Murray Bailey, a Democrat-turned-Republican nominee for mayor in 2015 put that number at $3 million at the time, but raised less than $30,000 and won just 13.2 percent of the vote. Meehan said Ciancaglini – a boisterous presence on social media who lost a 2015 bid for Common Pleas Court judge – lacks the track record to show he can raise money. Still, his unconventional style could be a headache for Kenney. "He's a piece of work," Meehan said. "The mayor would be in an awkward position, because you never know what's going to come out of his mouth."